Are you losing friends as fast as I lose matching socks? Perhaps you have never been good at holding onto friends or creating long-term relationships. Maybe you have never taken the steps to deepen your relationships. We’ve all been there! Some friendships start so well, but fade out because you or the other person probably made one of the mistakes listed below. Are your stories always over-the-top and embellished? This is something that I personally dislike – greatly! Exaggeration is lying, people! When your friends sense that you are exaggerating to gain attention, they will stop giving you the responsiveness they once did. If you are known for this, fess’ up! Tell your friends that you are prone to exaggerate the facts and you are working on becoming more literal. Nothing restores a friendship more than owning your problem, working on it, and showing your friends that you are capable of change. Take a few minutes to listen to the impressive Ted Talks by Celeste Headlee! She gives some invaluable pointers on how to have a successful conversation. Opposite from above, perhaps you don’t talk enough! Because you do not engage in much conversation, your friendships may become stagnant and boring. Even if you are incredibly shy, you can start practicing the art of conversation. Start by asking questions – this way you will not have to do much of the talking. Most people love being asked questions about themselves and this also helps you to find something in common. “What is on your life’s bucket list?” “What do you like to do in your downtime?” “Do you have a dream job?” “Where did you grow up?” “If you could live anywhere, where would you live?” Choose an area that you are interested in and ask a question! You will be surprised how quickly asking questions can turn into a meaningful conversation. If you are an unconfident individual, start taking steps to increase your confidence. “If I were you, I would have…” Do you give your opinion without being asked? Do you always need to interject your thoughts into every conversation? I can guarantee that you will lose friends! Stop giving your opinion unless you are asked for it – especially in the early stages of a friendship. This is a bad habit that makes you look egotistical, uncaring, and self-absorbed. Once you have built the foundation of love and trust in your friendship, then you can give your opinion more readily. Until then, keep your mouth shut and let your friends talk! I’ve totally been here! Life is crazy busy and it is difficult to take some time for yourself, let alone your friends. Why does it seem that they always want to make plans when you are the busiest? However, if you decline too many “hang-out” offers, they will probably stop asking you. Carve some time into your schedule to create new friendships and nourish existing relationships. If you find that THEY always make the plans, beat them to it and schedule something that will work with your schedule. Find something that works! Friends are a very important part of life and should be well-worth the time investment. Do you make promises that you don’t keep? Are you the friend that always makes last minute excuses? You always forget, have a headache, are too tired, have a family emergency, etc. Your friends cannot depend on you because you have proved yourself to be unreliable and unpredictable. Have you heard the saying “You’re only as good as your word”? Start showing up and keeping your promises! The only way that will change your friend’s perception of you is to create a new track record of changed behavior. “May I borrow that?” “Do you mind picking me up?” “May I come with you?” If you are asking your friends for favors all the time, you are draining your friendships! Stop thinking that friends are for favors – that should be a two-way street. If you are not doing for them what they are doing for you, you need to reevaluate your priorities. Yes, true friends should always be there to help you, but you can easily chase them away with this self-centered behavior. 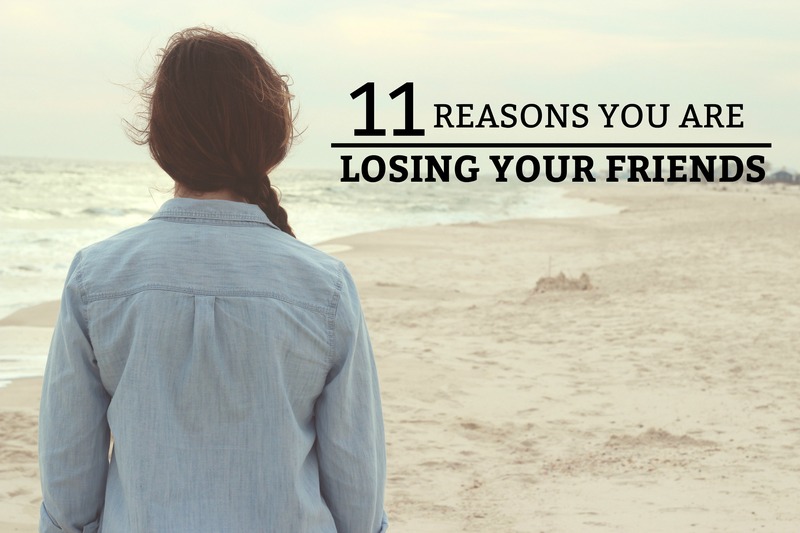 What makes you a lousy, unsupportive friend? Are you the kind of friend that doesn’t mind “being there” when times get tough? Or do you prefer to avoid and hide until the storm has past? Typically, being supportive is easy! If you have quality friends, “being there” for each other is not a difficult thing to do. When your friend needs help or someone to talk to, make yourself available to them. When things go well for them, applaud and celebrate their success! And when the “going gets tough” (which it will), be the source of help and encouragement that they need. Someday, you will need support as well! If you can always find the negative side to every situation, then you have the dark and undesirable curse of pessimism. You can turn the happiest situation into a disappointing waste of time. Typically, people choose friends who make them feel good about life! You don’t have to be obnoxiously positive, but you can brighten up your viewpoint! Stop verbalizing your negative opinions, and try to look on the bright side! Be the breath of fresh air that every friendship needs. Is your opinion all that matters? Do you prefer your friends to work around your schedule? Do you like to be center of attention and dominate every conversation? I can guarantee that people identify you as a narcissist: self-centered, jealous, insensitive, and uncaring. This is one of the most difficult lifestyle choices to change. You must identify that your behavior is toxic and make a genuine effort to change. Otherwise, your circle of friends will quickly decrease. If you can identify with any of these behaviors, you need to make some changes in your life! Perhaps you are have bad habits that are ruining your romantic relationships. The most successful way to start this process is to apologize for your behavior and/or let your friends know that you are working on making a significant change. Let them be your accountability partners, so you will know when you are sliding back into your old habits. However, if you are unable to mend old friendships, make a fresh start! Be the kind of friend you would want to have and watch your friendships flourish.